The 45 Gin School offers a unique experience perfect for any gin lover. Located in the oldest retail building in Leicester, close to both 45 bars and overlooking Market Place, our stunning new venue offers you a unique insight into the magical world of distilling. Your 45 Gin School Experience lasts for 3 hours and includes – Cocktail & Gin infused Masterclass, Questions & Answers by our Distiller, complimentary Burleighs Gin & FeverTree tonic, choosing and blending botanicals to create your own unique recipe before distilling, bottling and labelling your craft gin creation ready to take home and drink at your leisure. 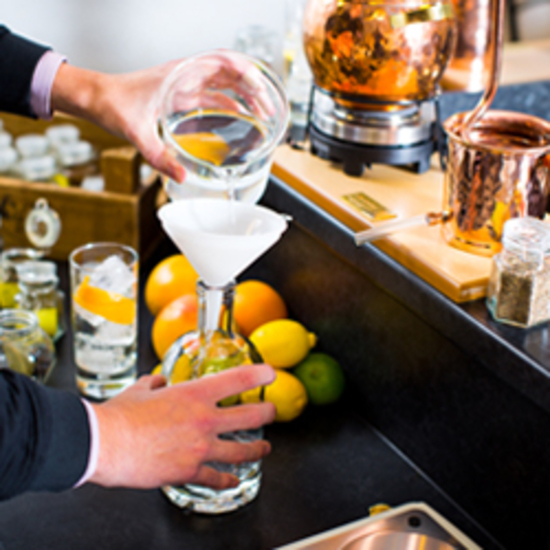 The 45 Gin School offers a unique experience perfect for any gin lover. Come along to one of our sessions for a once in a life time lesson on the art of distillation and create your very own bottle of London Dry Gin to take home and enjoy! You must be of 18+ years of age to attend a 45 Gin School experience.